Sleeping in the trees? 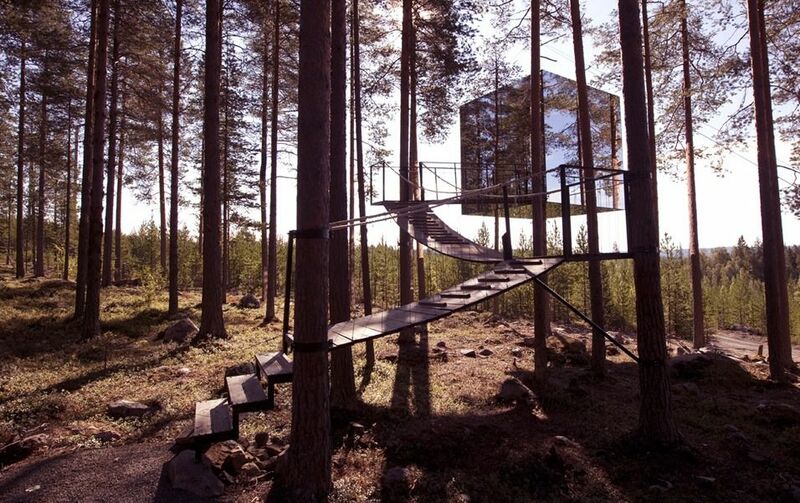 The Treehotel, in northern Sweden, offers a one-of-a-kind experience with their unique “treerooms”. There’s the Mirrorcube, a 4 metre cube suspended in the air via an aluminum frame attached to a tree trunk. On the outside, the walls are reflective but treated with a special coating so birds don’t fly into them, and on the inside, you’ll find a double bed, bathroom, lounge, and 6 windows allowing for a panoramic view of the surrounding forest. Some of the other rooms include the Bird’s Nest (yes, it genuinely looks like a giant bird’s nest! ), the UFO (yes, it looks like a clam-shell UFO! ), and the Blue Cone (it’s red and not shaped like a cone…hmm? ).